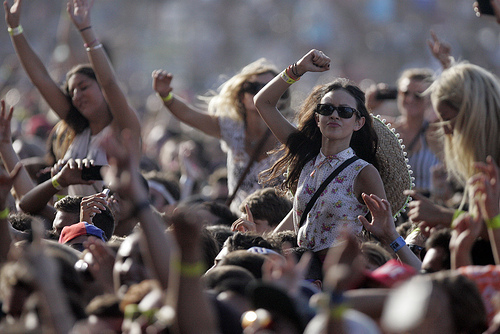 As the weather warms up, music starts to fill the open air. There’s no feeling quite like listening to your favorite band while dancing, swaying, or sitting on the lush green grass. Summer means festival season, but just as important as getting your tickets is choosing the correct clothing to wear. Here are some easy do’s and don’ts of music festival fashion. Bucket and wide-brimmed hats are a must. The brims protect your head from the angry sun’s rays. It also helps that they are completely stylish, especially when paired with the correct accessories. Head banded and boho bandeaus also help add flair to any outfit. On the other hand, feathered headdresses and other stereotyping headwear is not only unfashionable, but offensive. Stay away from offensive head or body wear, no matter what band is playing at the festival that day. Stay comfortable with crop tops or loose shirts. If you’re going to be sitting out in the blazing hot sun all day, you don’t want to be dressed all in black, which only works to trap heat. Wear colorful, breathable shirts or a sleeveless dress. Denim is quite popular at most outdoor festivals, and they work well for full-legged jeans or as cropped shorts. Stay away from fringed bottoms and one-piece suits such as rompers. You really don’t want to be wrestling with your bottom (and top) of choice while in the port-a-potty. Make sure to bring some high-topped shoes, comfortable boots, or sandals. If you know you’re going to be moving from one area to another, make sure your feet will be happy at the end of the day. Stay away from high heels and boots that come up too high past your ankles. Thigh-high boots are a definite no. Dazzling earrings, ear crawlers, a bracelet, a necklace, and a pair of UV-blocking sunglasses are more than enough to make you fashionable in a music festival crowd. There’s no need to dress head to toe in dazzling gold, silver, or plated bronze, however. Steer away from excessive bracelets and arm cuffs. Don’t forget to bring a bag with straps. It could be a backpack or cross-body bag. Just make sure that it can hold everything you need such as your wallet, tickets, a water bottle, and maybe a few snacks. Save the clutch at home for a night out on the town. The most important rule of music festival fashion is not to go overboard and don’t get offensive. This isn’t the 1960s. Wear clothing that will keep you comfortable all day long, and you won’t be sorry.